Why do rich people have more money? I hardly keep in touch with friends from my school days. Actually, I hardly keep in touch with anyone apart from family and a handful of closer friends. I grow more reclusive as I age and, honestly, I rather like it this way. So, when I received a call from a friend whom I have not heard from for more than 10 years, it was more than a surprise. I was momentarily stunned. What do you say to someone whom you have not kept in touch with for so long other than the usual "How are you?" "I can't retire soon. Rich people need to make more money because they have more things to spend on." I was somewhat taken aback and asked him why he said that? What did he spend his money on? He started counting the items using his fingers and I cannot remember all the items but I remember "a big house and two cars" being on the list. Then, I also noticed then that he was wearing a luxury watch. His clothing and shoes were also probably from some luxury brands but I wouldn't know, would I? I also remember that I felt somewhat self conscious then with my outfit (not Boss but Bossini). Poor AK was psychologically scarred. I wasn't financially as comfortable back then and was trying hard to build my wealth like I was doing most of my life. "It is not enough to be rich. You must appear rich." Now, at the ripe old age of 45 and with what I have achieved, I can confidently tell these friends that they are wrong. They are so wrong. Oh, you want to know why did my friend call me? Oops. I am growing forgetful in my old age? "Er... Could you loan me $50K?" I was so stunned like vegetable. I kept quiet and he went on to explain. Apparently, his business is not doing well and he exhausted what savings he had. There is no way for me to know if he was telling the truth or not and this is someone whom I have not been in contact with for more than 10 years. So, what was my answer? I offered him $2K, saying that I was not comfortable to lend him any amount larger than that. Rich people don't have to make more money because they have more things to spend on. 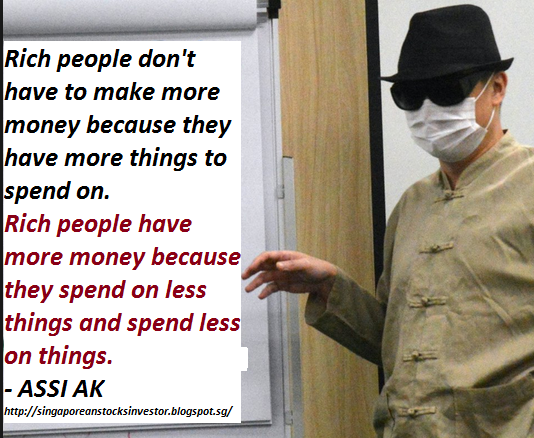 Rich people have more money because they spend on less things and spend less on things. I shan't say anything else but you might want to read the related posts below for my thoughts on "being rich" and "lending money". 1. If we are not rich, don't act rich. 2. Lending money? Ask questions. The chinese saying "无事不登三宝殿" is always true. I wouldn't even lend a so called friend $2K whereby both parties did not keep in contact for more than a decade. My lame attempt at a melayu joke. Hehe..
Quite sad to see that people end up with such situations because of money management and lifestyle inflation. ..
Ak, I think you don't expect to have the $2k returned after the offer. .don't u? You are a generous man who write off the $2k loan. I think being polite when asking for help/loans is a very basic essential behaviour of a minimally decent person. It's not easy asking for money. I wonder that day I come when I need to ask for money. I think I wil feel super horrible ... That he ask u, a long "lost" friend, he might be pretty bad in debts with the loved ones and "close friends" Liao. But, if u offer me 2K, I will take it. I might feel like you are treating me like a beggar, but in that situation, I will take. I might felt insulted and damn lousy, but I will bite tongue and take, and hopefully I can find 5 more AK. I didn't feel good about rejecting him but I would have felt worse lending him $50K, I am sure. I had to do what would not make me lose as much sleep. Consistent with my philosophy on lending money, it must be a sum of money that I am prepared to write off. For an old friend who has not been in contact for more than 10 years? For old times sake, $2K is still acceptable. Not $50K. The difference between lending and donating. Even though I offered $2K and not more, it was goodwill on my part. My money did not fall from the heavens and it could be used elsewhere too. He could have taken the $2K first. In fact, he probably should have done it if the situation is dire. I know I would have taken the money if I were in his shoes. You are a kind man, AK. Honestly, I will save the 2k outright. May be he heard about your success from other friends. It's not too long ago you told them you have retired and sleeping on a bed of money and condos of gold. If desperate, would have taken the 2k, and go look for other opportunities. I don't keep in touch with many friends. However, I have not changed my phone number in more than 20 years. So, it could be that he was just trying his luck. That would show how bad his situation might be. Some might call me heartless but it might not be a bad thing for him to declare bankruptcy and to start over. It will be tough but it might change the way he looks at money and what defines "being rich". Okay what $2k sounds like a good charitable amount that he should consider taking.... I meant since he have exhausted all his options and he still wants to choose... hais. There's a saying "beggars can't be choosers"
Anyway, this is life isn't it. I suppose his pride was still intact. If he should call me again to take up my offer, I will still give the money to him. Difference between lending and donating money. Unless we are rich, be pragmatic and not romantic. Just by closing the shop alone, you would be saving a chunk of change on its rental. Then, you only have to worry about his living expenses (if you want to) and I don't think that is anywhere close to $2800 a month. truly rich people have cash flowing generating assets. not enough to have value in assets, must generate positive cashflow. How much material wealth is enough?